A single raven calls from the trees at the base of Astroman in Yosemite Valley. I chalk my hands and put on my climbing shoes, then climb in the shade of the late afternoon while the raven silently drifts nearby on warm currents of air. I am not alone. 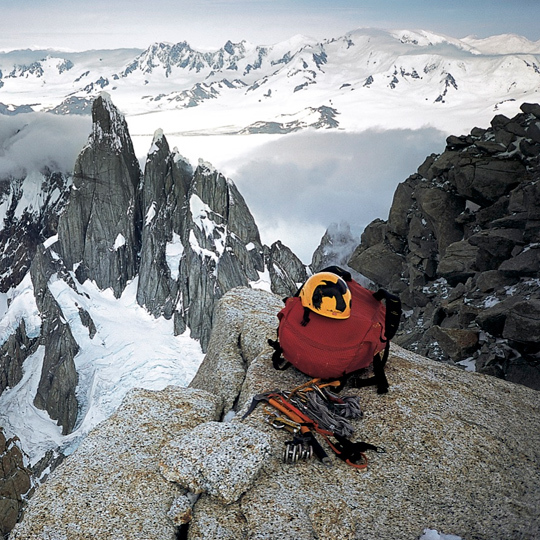 On the last pitch, an exfoliating granite face, I struggle to keep my head together, until I am soothed by the sight of the lone bird disappearing over the top of Washington Column. I have always related to ravens. They appear in my dreams at night and find me during the day. I notice them as signs, finding significance in the direction they fly and the tone and number of their calls. I often involuntarily answer with my own raspy "kahhhs." Before setting off solo to Patagonia this year, I spent December in Utah, luxuriating in the warmth and dryness of desert winter and hanging out with my best friend Brad. On the Tombstone, a beautiful sandstone formation, we sat on a high ledge, watching the ravens soar. The birds cawed out as we talked. On the ledge, Brad pointed out that there are no ravens in Patagonia. Disturbing, because for me the black bird is a symbol of protection. I was already sketched about the starkness of soloing in those windy peaks. Brad came up with the idea of painting a raven on my helmet. The next morning we sat at our favorite coffee shop, sipping dark creme off the top of perfectly made americanos. Sydney, the barista, not only makes great coffee but also is an artist. But when Brad asked Syd about painting my helmet, she gave us a strange look. I was pretty sure she thought we were geeks. On cup number two or three, I asked her again, and this time we were floored by her answer. "It's really strange you want me to paint a raven, "she said, pausing for quite some time. "I was out behind the shop a few weeks ago and found a dead raven, freshly killed. Its body was still warm, and it seemed like it had been fried on the electrical wires." Our jaws dropped. I wondered if Sydney had ever seen my business card—with my drawing of an electrified raven—but I knew that there was no way she had. "It's perfectly preserved," Syd went on. "I didn't know what to do with it so I wrapped it in plastic and kept it in my freezer." Over-caffeinated and amazed, we started giggling out of control, chanting in unison, "You must paint the raven! Show us the dead raven!" Luckily, Syd seemed to understand. Later, I went to her house to drop off the helmet and see the bird. Its feathers were softer than I had imagined. It looked fragile with its wings folded over its chest. The next few weeks were hectic. Although I dreamt about the frozen bird, I didn't see Sydney again until I stopped by her house as I headed out of town for the airport. She handed me my orange helmet, and now a raven was flying into the burning sun. We talked about the bird she had found and decided she should have a ceremony for it, returning it to the earth. We both felt strangely relieved. I headed south. Patagonia and the weather was breaking. Within a week I sent my prime objective, free-soloing the Supercanaleta on Fitz Roy. Everything went perfectly and I fired the route in six and a half hours. My helmet only got a few scratches, so I went back for more. This time a full Patagonian storm started raging, and I lay below Fitz Roy again, huddled in a tiny cave. Deafening wind showered me with snow and ice. Wedged with all of my gear inside my bivy sac, I struggled to get free before my bladder burst. I covered my equipment with rocks and hurried to the other side of the boulder, barely aligning my zippers in time. With newfound relaxation, I realized that here it was calm while the wind pummeled my nearby bivy site. I shook my head: I had been torturing myself for the past eighteen hours, twenty feet from a comfortable bivouac. "Nothing's going right," I thought. The day before, I had nearly been offed by rockfall, and then barely self-arrested by catching a jagged rock as I slid near the top of the approach gully on Sitting Man Ridge. "I shouldn't be here!" I called into the wind. Somehow it occurred to me that I should be soloing Cerro Torre instead. I needed a sign—as if the weather deteriorating around me weren't sign enough. Still, I kept thinking that I should just calm my thoughts and focus on Fitz Roy. I was probably just scared, probably just trying to talk myself out of this climb. The weather would clear. Suddenly, my concentration was broken. As I turned to look at my gear, the helmet took flight. It spiraled up past me in slow motion, a black raven and a setting sun. It flew off toward Cerro Torre and disappeared. I jumped up, screaming, "HELMET!!" With no time to put on my Gore-tex, or even my boots, I raced out onto the glacier in hopeless pursuit. In my one-piece fleece suit, socks skidding over ice, I felt like a spastic kid in pajamas-with-feet. The wind pushed me farther out toward a crevasse field. Surrounded by gaps that fell into emptiness in the ice, I came to my senses. I realized the helmet was gone. It had flawlessly served its duty. I finally understood that it was time to go. I crawled uphill against the wind, barely able to fight my way back to my clothing. With all my gear crammed into a light-and-fast pack, the thin straps cut into my shoulders mercilessly. It was going to be a long retreat. I left Fitz Roy and headed down. For the rest of the day and most of the night I struggled through endless melted-out crevasses, climbed thousands of feet up over Paso Cuadrado, then descended 5,000 more toward Piedre del Fraile. The wind knocked me down countless times as I followed a stream downhill. It blew the icy water up, showering me with stinging sheets. I tried not to sink into depression, endlessly walking. I completely circumnavigated the Fitz Roy massif and returned to Campo De Agostini. Nearly forty-eight hours after I had left, I was safely back, but I had been through one of my most trying times. I passed out. My friend Jose shook me awake the next afternoon. Barely coherent, I told him my story and asked if he knew someone with an extra helmet. Jose laughed and ran off to his tent. Still in a daze, I saw him coming toward me with a funky yellow Euro helmet. It had a small black raven printed on the front. I smiled, knowing. Things fell into place perfectly over the next two days. Though exhausted from my mission around Fitz Roy, I managed to get into position below Cerro Torre. I fired the Compressor Route from the glacier, in eleven hours, alone. In the intuitive flow, I free soloed the first integral ascent of Californian Roulette, on Fitz Roy's 7,000-foot west face, a week later. While rappelling, I was struck by rock fall and barely made it down. As usual, I needed a strong sign to go home. Now, back in the desert, I try to regenerate my lost energy. In my dreams I'm flying, black wings spread. I listen to the world around me, fully aware, open to the call. To see more on Dean and his current adventures, check out these links: DeanSPotter.com, Instagram.com/DeanPotter, FaceBook.com/DeanSpotter, Twitter.com/DeanSPotter Vimeo.com/ondemand/valleyuprising, Vimeo.com/ondemand/whendogsfly. Wow. Very well written and engaging. 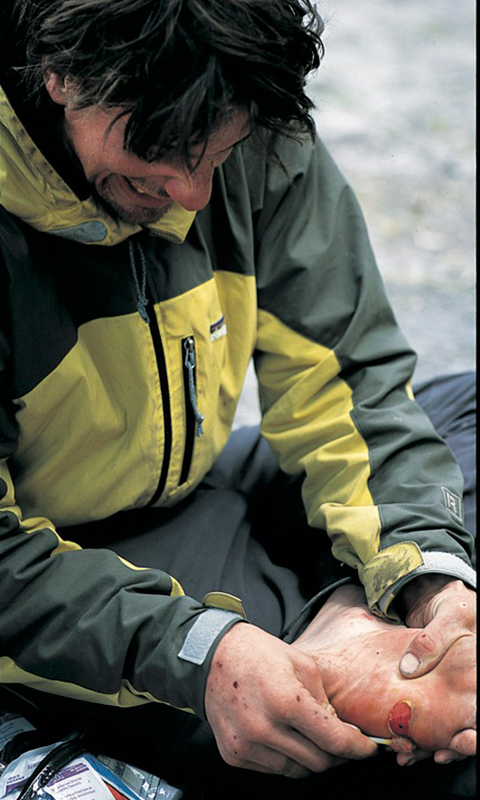 Respects to Dean Potter. Now you can fly free and visit Chalten when you want, abrazo desde la Patagonia Argentina Dean!